Jonathan Nossiter’s new book inspires a research project. Taste and Power — that’s what the wine business is all about. 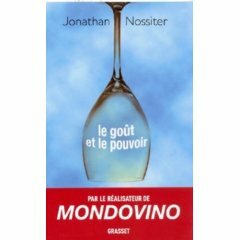 Or at least that is the thesis of the new book (Le goût et le pouvoir) by Mondovino director Jonathan Nossiter. Those with power can influence taste or even dictate it. The English translation will appear later this year. For now I am working my way through the original French. I’ll post a review when I finish. A recent conversation with Tyler Colman, a.k.a. Dr. Vino, started me thinking about the influence of wine critics and how globalization is increasing their importance. Think about the number of wines you have to choose from. My local upscale supermarket stocks more than 1500 different wines from at least 15 different countries. This is an enormous and complex choice space that ranges from the familiar to the exotic and from inexpensive to near investment-grade. And the number of choices is unexceptional. A local farm store, with acres of space to fill, actually stocks more than 3500 wines from more than 25 countries. The simple fact of this embarrassment of riches makes wine critics useful and influential. How can you make an intelligent choice from among so many different wines? It is difficult to know what’s in the bottle without tasting and there are too many to taste. Wine critics are middlemen who do the tasting for us and arbitrage that information, reducing the uncertainty that is both the joy of wine and its curse. (Wine brands are another way to reduce uncertainty and increase sales, as I have discussed in earlier posts). Wine critics and their descriptions and ratings would be useful if you have only 100 wines to choose from. With thousands of wines available, they become practically indispensable. The global expansion of wine trade increases choice and uncertainty and magnifies the value (and power?) of wine critics. Wine critics are important for other reasons, too. Wine can be an investment as well as a consumable product and wine critics provide information to this forward-looking market. The question here is not what wine tastes like today, but what it will taste like in several years and, most importantly, what a buyer will pay for it in the future. Here, because there are so many unknowns, wine critics can have great influence. Some wines probably have investment value because the critics say they do, so much is the market driven by critic-inspired perceptions of value. Critics are also important because wine is increasingly an identity investment, not just a financial investment. Individuals invest in both wines and in specialized knowledge about wine both for their own pleasure and to make a statement about their identities. To be very knowledgeable about wine is to display a specialized cultural sophistication. It isn’t the same as owning a Ferrari or a Renoir (it might be more expensive than owning a Ferrari or Renoir) but it makes a statement in the same way. The very best wine, not just good wine, can be an object of obsession, hence the outrageous prices that are paid. Wine critics both enable and encourage the quest. The influence of wine critics are everywhere in the wine market, from budget buyers seeking good value to elite wine collectors. You can complain about their power and dispute their taste, as critics of Robert Parker frequently do, but they are here to stay. So I think we need to learn more about them. Hence my current project. I’ve collected a number of wine publications (click on the photo above to see them) that evaluate and rate wines as well as provide other information about wine, including investment reports, wine tourism guides, winemaker biographies, food and wine pairing tips and so on. Rather than criticize their numerical ranking scales or bemoan their philistine tastes, I want to compare and contrast them, to try to figure out what wines they are rating, how, why and for whom? My working hypothesis is that wine critics are simultaneously influenced by the market segments they inhabit and shape them, too. If I’m right, then these publications should be very different, even when the wines they evaluate are the same. The publications I’m studying are Wine Spectator, the best-selling American wine magazine and Robert Parkers Wine Advocate, which is said to be the most influential. 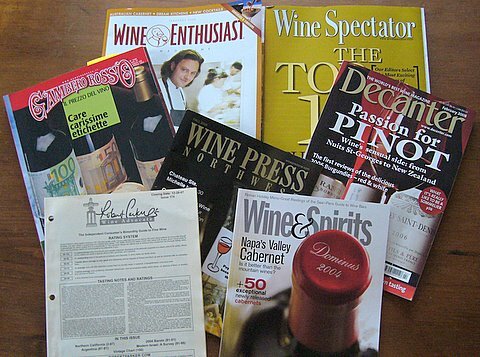 I am also examining two other national publications, The Wine Enthusiast and Wine & Spirits, Wine Press Northwest, a regional publication, and two very important foreign journals, Decanter (Great Britain) and Gambero Rosso (Italy). Watch this space for upcoming reports! Wine is, I agree extremely important. It is after all one of the oldest known beverages and has been drunk even when it was unsafe to drink water! Wine tourism has grown, slowly, but sustainable over the recent years and I feel this is one piece of a whole “Culinary Tourism” niche that is about to develop at a rate of knots! I am not to sure of the “pure” wine critic as often the descriptives as cryptic as some wine labels, after all who wants to drink a wine with the essence of “the bottom of a running shoe” as I heard recently! Of course the tasting of wine is subjective, the same a music and movies! I feel more availability of wine/beverage tours is required for travellers, but I have to add here in a way the removes the “snob factor” in much the same way as many destinations has with opera. Marketing of such tours needs an unbiased approach, one that provides all information in a clear and standardised manner. I was recently at New Orleans where I attended a tourism conference, there I heard a guy called Erik Wolf speak from the International Culinary Tourism Association, he presented a new project of theirs called “FoodTrekker.com” which sounds amazing. We will be able to search for, read about and book vineyard/brewery tours/tasting, and the site aims to provide a level playing field between the big and not so big guys, so the more special and unique places can be visited. We will be able to piece together our own itinerary and then print this off prior to our travelling- no more heavy books to cart about taking up valuable space in an ever shrinking baggage allowance! Of course wine will be apart of this site as it is about anything to do with the culinary/beverage arts! I find this extremely exciting and so look forward to this becoming live, and with UK/Europe and ultimately Global content! This is great for all who love food and drink, the bigger guys will see the world is their competition, so as consumers I think we all gain to win, and this will keep all on heir toes! So I raise a glass [or two!] to much more in the way of finding what is unique and special!